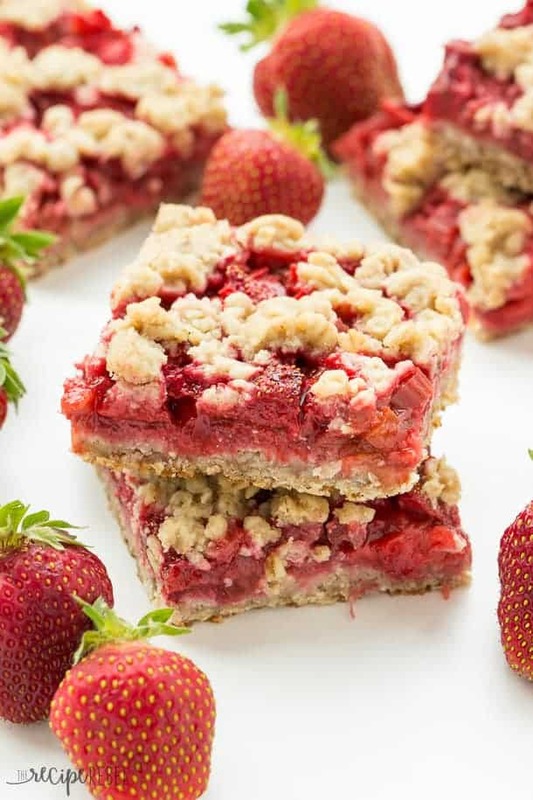 Oatmeal cookie base topped with sweet and tangy rhubarb and strawberries covered in more oatmeal cookie topping — your favourite summer dessert is now a portable treat or back to school snack! I once asked this question over on my Facebook page: fruit crisp or fruit pie? At first, I was a little alarmed at the amount of pie people popping up and taking over. But once I sent a shout out to all my crisp lovers they slowly came through for me. I am a crisp lover. I am not reeeeally a pie lover, unless it’s filled with chocolate or peanut butter or it’s on an Oreo crust or it’s in ice cream form. Or unless it’s only dessert option, because when it comes to pie or no dessert you better believe I’m eating pie and loving it. As long as there’s ice cream. So last summer, when Julianne from Beyond Frosting asked if I would bring something over to share, these bars were not even a thought. I’d hate to think about what might have happened if she’d never asked — you might not have been feasting your eyes upon them right now. And that would be sad. Because they’re amazing. I’ve since updated the post so that you can find the full recipe below, because Spring is short and you should be eating as much strawberry rhubarb as you can get your hands on. When I came up with the idea for these bars, I was determined that there would only be one crumb mixture and that would serve as the cookie crust and the crumb topping. I am not into extra work. Obviously I had to use the oatmeal cookie topping from this Berry Cherry Crisp (also amazing). I doubled it and it worked so well! The perfect sturdy base for the fruit and just enough left over to sprinkle over the top and let that gorgeous fruit shine through. Are you guys rhubarb lovers? I mean, you’re here, so…. But really — there are people out there who don’t like rhubarb. I used to be one of them. As a kid, anything even a little bit tart was not dessert. Lemon, lime, rhubarb — I detested them all. Slowly, though, I came around. And now? Total obsession. Especially strawberry rhubarb. And with fresh summer strawberries? Perfection! These are the perfect bar to take you from summer right into back to school — they are incredible cold, straight from the fridge, or warm them up and serve with some vanilla ice cream! These Strawberry Rhubarb Crips bars taste like summer! Crispy crust and topping filled with summer fruit! Preheat the oven to 350 degrees F and line a 9x13” pan with tin foil, lightly greased. Set aside. In a large bowl, combine brown sugar, oats and flour until mixed. Add the butter and mix with an electric mixer, a pastry cutter or your hands until combined. Set aside 1 packed cup of the oatmeal cookie mixture. Press the rest into the bottom of the prepared pan, covering the bottom entirely. Bake bottom crust for 10-20 minutes until dry on top and lightly golden. In the same bowl you used to mix your oats, combine your strawberries, rhubarb, corn starch and sugar. Spread on top of crust and crumble the remaining oat mixture on top – it will not cover the top completely. Press down the oat mixture slightly. Bake for 45-50 minutes until the filling is bubbly and thickened and the oats are light golden brown. I only had frozen rhubarb available. You can easily substitute fresh but it won’t release as much liquid as it bakes, so you’ll need to reduce the corn starch to about ½ tbsp. « 25+ No Bake Dessert Recipes for Summer! I’ve used this recipe countless times because it’s so easy to measure and it’s adaptable throughout the seasons. 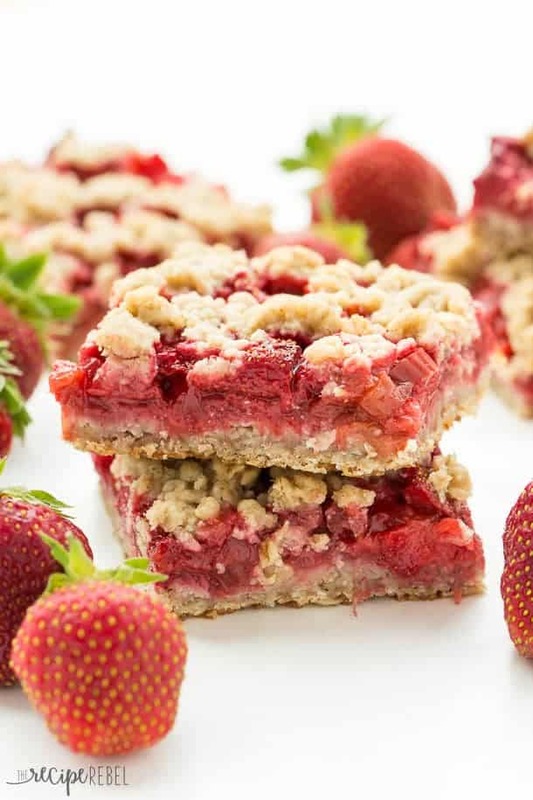 I made it first with fresh rhubarb and strawberries in Spring as the recipe intends, but you can pretty much put in 7 cups worth of any baking fruit (apples, pears, mixed berries) and it comes out great every time. Make sure not to cook the base layer too long or it gets tough. I’m so glad you liked them Jenna! Thanks for leaving a comment! I am confused by the two recipes above. Big difference in amount of corn starch and cooking times. Sorry Sue! When I switched over to me new recipe box something funny happened and earlier versions are displayed below.. Always go by the recipe in the box — I will go in and delete the previous one! Amazing recipe!! I veganized it with vegan margarine. No tin foil, just greased a pyrex baking pan. I used fresh rhubarb and 1 T cornstarch and the texture and taste was spot on. Definitely heed the advice to cool/chill before cutting! Tried these today. OMG! There are sooooooooooooo good. Thanks for a recipe I will be making again. I made these yesterday and was pretty bummed. The taste was fantastic but I could not get them off the tinfoil. And I had made sure to grease the foil pretty generously. Unfortunately, the bars weren’t presentable once I got them separated from the foil. Perhaps they would work great without the tinfoil but I’m not sure I’m willing to try again. They were also more mushy than I would have liked for a bar. Flavor was excellent though! Oh I’m sorry to hear that! I’ve never had any trouble with these bars coming out. Maybe you could try parchment paper next time? I think it’s even a little better than foil for being non stick. Hi ! I made these last night to bring to my office. After giving my husband a taste last night, I had a terrible time keeping him away from them. My co-workers finished them off in minutes. They were perfect and are my go to recipe now. Thank you. These look amazing! Wish I found this when it was rhubarb/strawberry season…may still find some! You might! I can usually find frozen rhubarb if I can’t find fresh! I am a crisp lover too and in my opinion, strawberry + rhubarb is like the best combo right now! these bars look amazing!!!!! Beautiful Ashley! Truly beautiful! Just love those gorgeous colours and flavours – yum. Pinned! OOOOOH!!!!! These look AMAZING!!! I too was not a rhubarb fan as a kid, but now I love it with strawberry. I am a total crisp lover too! I’m not a big pie unless is a dutch apple pie, then I can eat enough for you and I both. 🙂 So I have a confession to make. I’ve never eaten rhubarb. Can you believe it? 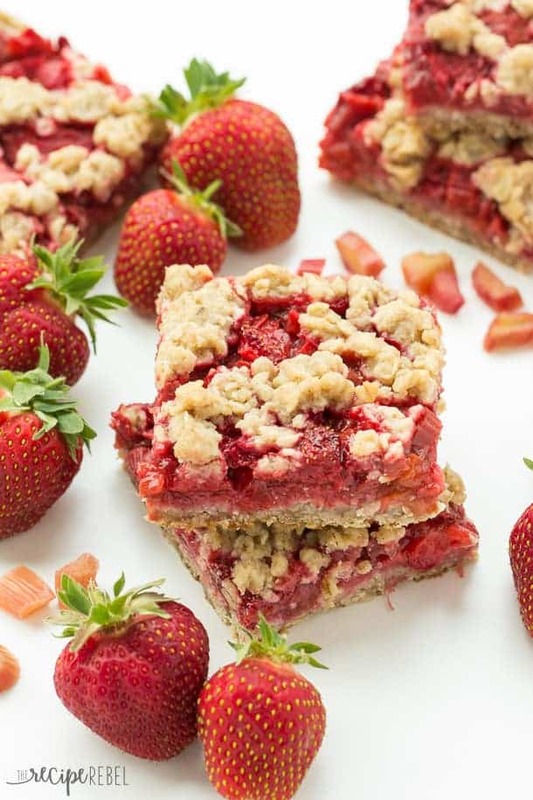 These bars look incredible and I need to make them before rhubarb is gone for the season. Pinned! I think you definitely need to add it to your to try list! I know it’s not available everywhere though, but man, I love it paired with something sweet! Oh boy! What a magical fruit bar! Just love that crisp topping. I want to face plant! If these don’t scream summer – I don’t know what would!! Beautiful! These bars look amazing!! I’ve never baked with rhubarb before. Really need to give it a try! You absolutely do! It’s one of my favorite things about summer! Love these crisp bars! They look gorgeous! 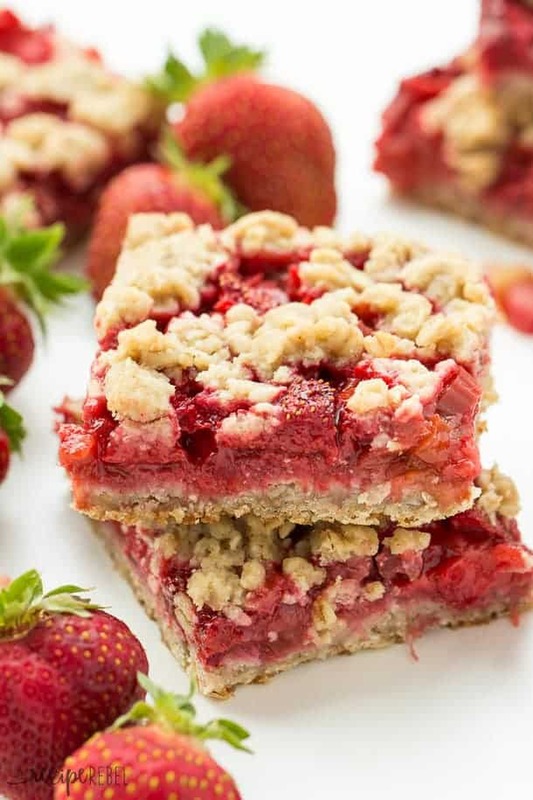 Strawberry and rhubarb is such an amazing combo and that oatmeal cookie topping is totally calling my name! I grew up eating lots of rhubarb, yummy crisp bars! Strawberry rhubarb is one of my favorite summer combos! Hi Stacey! I have always loved rhubarb! I have a recipe for a crisp that my husband’s secretary gave me years ago. Unfortunately, rhubarb is one of the things that won’t grow here – we’ve tried, but the soil (or more aptly described “clay”) just kills it off! I have a good friend back in MI who used to bring me rhubarb every summer so I would make me pie – his wife didn’t bake. Now I’m on a quest to find some thanks to you! 🙂 Actually we are going to Knoxville tomorrow (furniture shopping) and I know of a food co-op that just might have some! Yes I’m really glad we can grow it here! We just planted our own bushes this Spring but we won’t get enough from them this year to make anything. Hopefully next year! These look seriously amazing!! I love strawberry and rhubarb flavor combos and especially with a crisp topping 🙂 Gorgeous! 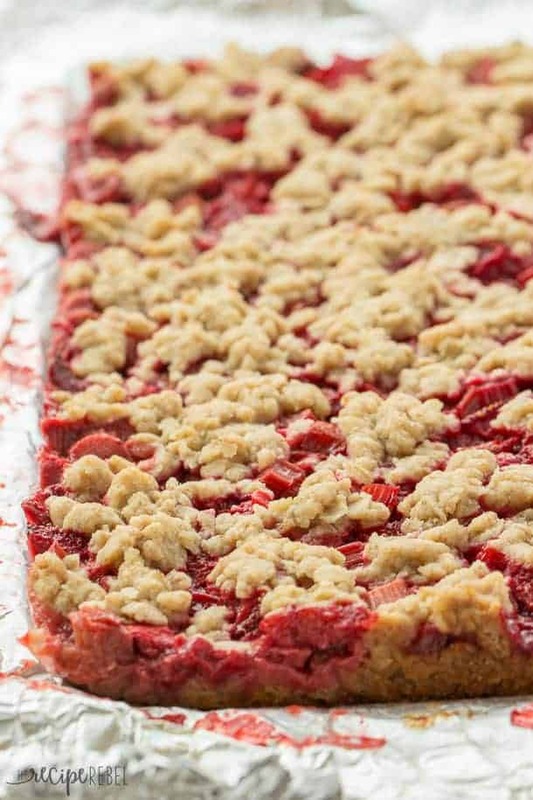 That streusel topping and the irresistible red color makes these bars irresistible!